The Austrian Bruno Nagler began work in the rotory-wing field in 1929 when, with Raoul Hafner, he built his RI Revoplane near Vienna. This was a single seat machine with a rotor driven by a 45 hp engine and had a vertical torque-balancing surface acting in the rotor downwash. This machine, and also similar RII machine of 1932, was successfully tested in Great Britain. in 1934, Nagler brought out his Heliogyro which had a 90hp Pobjoy radial air-cooled engine, a two-blade rotor and a pusher propeller. The engine could drive the rotor for hovering, when torque was balanced by a vertical surface, or the propeller could be driven for forward flight leaving the rotor to generate lift by autorotation. This single-seat aircraft was tested in Great Britain in 1937. With the outbreak of war, Nagler joined with Franz Rolz to form the Nagler-Rolz Flugzeugbau. The new company built a helicopter similar in configuration to the RI and RII. This ship had an empty weight of 700 pounds and though it was flown in hover, it could not be lifted out of ground effect. With the coming of World War II, the company received contacts from the German Government for the development of small single-seat helicopters. In 1940 the first machine from the new company appeared as the NR 55, which had the unusual feature of a single-blade rotor. This rotor blade was counterbalanced by a 40hp engine which applied to it a torqueless drive by means of two small airscrews which pulled it round at about 135rpm. Because of gyroscopic forces at the engine location, the carburetor was mounted on the centerline of the rotor hub and fuel-air mixture was piped out to the engine cylinders. The rotor diameter was 10.5m, and the machine weighed about 338kg loaded, but, although a cruising speed of 97km/h was thought feasible, only hovering and lift test were undertaken because the machine was built purely for testing the rotor system. Development of the NR 55 concept continued in 1941 with the generally similar NR 54 V1, in which considerable reductions were made in size and weight. The engine power was reduced to 24hp and the rotor diameter to 7.8m with the engines mounted 1.2m from the centerline driving the propellers, which were 1.8m further out along rotor blade. The carburetor was never perfected to work satisfactorily and due to this no test flights were ever made. Performance with empty and loaded weights of 80 and 175kg respectively, was estimated to have a 55 mph cruising speed. The NR 54 V2 produced in 1941 was the world's first portable helicopter. 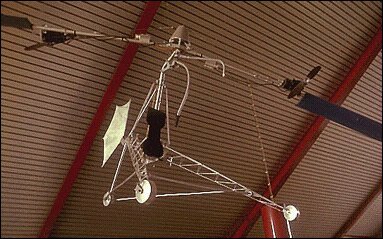 By development, the simplest possible single-seat helicopter had been produced, which flew on remarkably little power. The 6.9m rotor consisted of two single blades, each of which had an 8hp motor driving a small airscrew at 6000rpm to give a torqueless drive, and the pilot's controls consisted of two levers, one to alter rotor blade pitch and the other to control the engines. 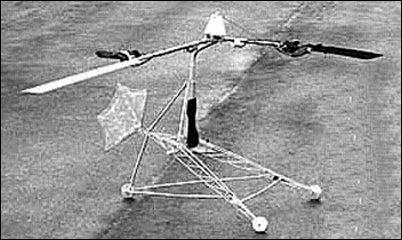 The entire airframe broke down for transporting and could carried by a single man. The little ship was said to cruise at 80km/h and climb at 140m/min, not bad for only a 16 horsepower. Four of the NR 54V2 machines were built before the war ended, but it is not known how close the NR 54 was to being ready for production at that point. At least one of them was brought to the USA for evaluation and is now in the collection of the National Air and Space Museum. The NR 54V2 is projected to be put on permanent displayed in the New Dallas Airport exhibition hall when it opens in 2000. He ended his career at Hughes Aircraft in Tucson Arizona. Thank you for this website. Can anyone comment on a follow on rotorcraft the Vertigyro in 1963? I have a polaroid photo of it and two men taken at the office on 10-4-1963. Trying to ID the people and find out more about the rotorcraft. Postoje li još neki tehnički detalji? Na kom su mestu motori na kracima? Prečnik elise? Korak elise? Kako se zakretao, kormilom pravca? Zorane, ovo jako lepo izgleda, mogu samo o vizuelnom delu da govorim jer se nista ne razume, ali je lepo i cak i da nije funkcionalno, a sigurno jeste funkcionalno. Интересантна конструкција NR 54 V2. Има ли неко детаље, за самоградњу? I joined Dr.Bruno Nagler in New York where we founded the Vertigyro Helicopter Co. to promote his helicopter torqueless system and rotary wing-tip air pressure for thrust. The Vertigyro configuration included a Piper Colt wingless craft on which a turbo engine and rotor was mounted. The craft operated as an autogyro at takeoff and in the air as an airplane using the Piper engine and propeller with the rotary blades as an airfoil. We also acquired the General Dynamcis flying car prototype and the Taylorcraft aircraft Company. When I received permission to bring the Vertigyro for a tethered test of the craft Dr.Nagler refused to go along. so I went to discuss matters with government experts who told me, based on the technical information I provided including Nagler's goal to sell the Vertiugyro for $10,000, the Canadians voiced serious doubts that we could ever build the aircraft even at that price. The effort folded thereafter and Bruno Nagler went to Phoenix to try his luck. My father worked on the Nagler helicopter in the United States. He was on the team who worked for B. Nagler who was trying to sell his concept to the U.S. Army. My father was a former American Airlines engine mechanic. He wnt on to work for Reaction Motors rocket company in New Jersey. That company built the engines for the X-Planes flying at Edwards AFB. He worked n the X-15 and later the moon lander Surveyor. He ended his career at Hughes Aircraft in Tucson Arizona. Thank you for this website.